The use of all-terrain vehicles (buggies, pneumatic) in the countryside is not a luxury but an urgent necessity. Especially in places where ground waters are close enough to the surface. Swamp buggies based on a normal motorcycle you can make yourself, if you have the skill to work with a welding machine, plumbing and avtodela. - wheels of the harvester and the tractor MTZ-80. Take the frame from the motorcycle, for example, IZH Planeta 4. It will weld the homemade frame and the marsh buggy. Put a new engine, for example, a motorcycle Tula. This is not the only used item that will be used. So this model is a good example of the second life of old things. This engine is chosen for its technical characteristics - efficiency, has forced air cooling. Replace regular ignition magneto starter of the tractor. This is due to the fact that this unit is designed for use on heavy soils, in the woods, so the battery better not hopes. Put the tank, seat and steering wheel from Sunrise 2M. Front fork make portable without shock absorbers. Install the chain drive, the chain pick up the gear. Rear axle and half shafts take from a UAZ-469. Brakes are not needed. The stop occurs during the engine shutdown. Take the wheels on swamp buggies from the combine. Remove the top layer of rubber from the tires, to facilitate construction the top layer of rubber from tires was removed. 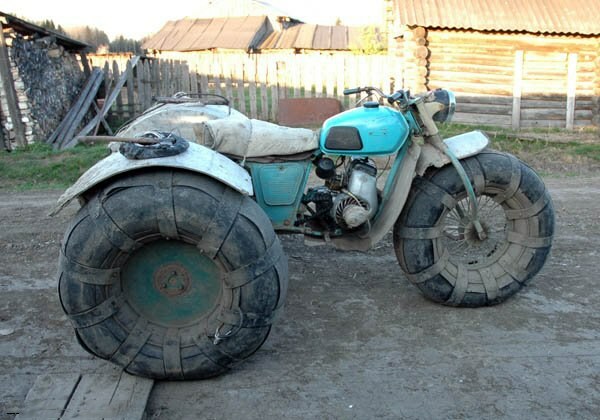 Rear tires must be with a good tread to easily move off-road. The main purpose of this unit is to simplify the work in the rural sector and to facilitate the movement of heavy soils through the use of pneumatic wheels. Make to help the farm to the swamp makeshift cart from the metal bracket. Take the front wheels of the tractor MTZ-80. Hitch make simple and reliable, for example through a conventional pin with a lock at the bottom. It is possible to easily carry loads weighing nearly 0.5 tons, or 2 m3 of wood on the road. In addition, the Rover can be used when harvesting in the fields in loose, moist soils, as due to the large area of contact with the ground, it will not stick.